Looking for marketing help, dear writer? Why, you’re in luck! Step right up to the Internet and tell old Google what you need, but be prepared to stay a while. A plethora of reading material and marketing advice abounds online, addressing the subject from every imaginable angle–and then some. Except, perhaps for this one: Don’t overlook the value of marketing your neighbor’s work. Yes, it’s challenging to understand how to apply those holy words to our writing lives. Especially when we’re constantly reminded that our platforms are everything and publishers find us only as attractive as our last sales numbers. But if God’s word doesn’t apply to all of our lives, it applies to none of it. Selfish ambition is building our platforms with tunnel vision to the work of everyone around us. God’s way is to step away from my work long enough to value yours. It’s a valuable principle of marketing. I once thought I stumbled across it accidentally, but I now believe it has been entirely by God’s design. He orchestrated it through my work as a radio talk show host when I began reserving a segment of time to interview other authors. In the early days of All Things Southern LIVE, these were authors I met during my travel– until publicists began discovering this new venue and pitching their clients’ work. I need to say this: I don’t promote everything that comes across my desk. Sadly, this is often a matter of pure time constraints. I don’t have the air time to interview even half of the authors whose galleys find their way to my desk. At other times, it’s a matter of my personal reading preferences or my understanding of the reading habits of my listeners. However, for these very reasons, when I do read something that entertains me, challenges me, encourages me, or flat out stretches me, I’m able to bring it to my listeners with authentic excitement. My audience knows this, so they trust my recommendations. So, how does this help my marketing efforts? Well, that’s the beautiful thing. God’s way is always a win-win. Over and over I’ve seen how celebrating the works of others rebounds to bless my own career. We’ve all been told to build a reader base and encourage that connection by staying in touch. We also know how distasteful it is to promote our own work. Introducing other authors to our readers–when we’re genuine about their work–allows us opportunities to stay engaged and interact with our communities in a natural way. In turn, our relationship with those authors invariably leads to our introduction to their readers. Now that is marketing we can all manage. Can I get a witness? 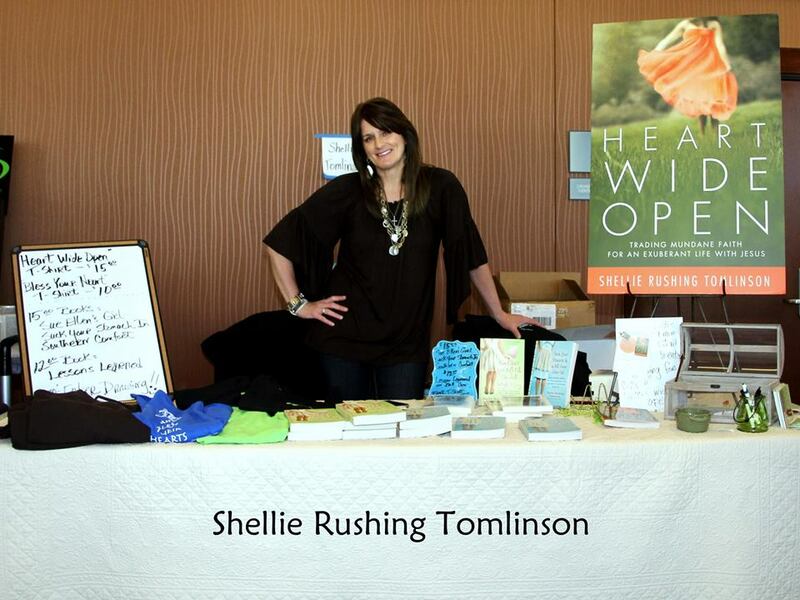 This entry was posted in Marketing and Promotion, Social Media and tagged Author Collaboration, marketing by Shellie Rushing Tomlinson. Bookmark the permalink. Often we feel forced out of our comfort zones as writers and speakers when we must promote our work. Sometimes it just doesn’t come across right in the gut, ya know? I believe you are speaking truth. Others first. Yes, indeed– I know exactly what you mean about that gut reaction. God’s way is always the better way, amen? Good word, Shellie! A spiritual principle came to mind as I read your post. “Give, and it will be given to you …” (Luke 6:38 NLT). “It can also be called the law of reciprocity, which is quite evident in the physical world: for every action, there is an equal and opposite reaction” (cbn.com). You do such an incredible job of practicing what you preach, Shellie. I am forever grateful that you’ve allowed me to visit on the porch with you at ATS, and it blesses me to see how God has been blessing you with such incredible connections because of your unwavering generosity. I know He will continue to do so! Keep writing and “marketing,” my friend! What sweet words, Jolina! I’m humbled by them. Thank you and you’re very welcome. It’s been a blessing to celebrate you AND your work. Self-promotion is so necessary today for writers but it’s hard to do when you’ve been raised to be humble. I’m the youngest of four and I’m lucky if I ever got a word in edgewise and when I did, it was never about myself. My parents didn’t tolerate ego, especially in children. When you are raised to believe that all people are equal, it’s doesn’t come naturally to suddenly have to toot your own horn. I think Shellie is right, however, that one way to do self-promotion is by sharing. When you promote the works of others, or share your own knowledge or insight with others, it feels good and it does seem to find its way back to you. And if it doesn’t, you can still be content with the way you’re living. This is fabulous advice, Shelley! It’s also a great way to look at the give and take of colleague friendships. When you give as good as you get, the friendship is a joy both ways. Count me every bit as grateful to have you in my world, Lisa Wingate! The industry tells us to self-promote yet our belief system says not to. It’s a constant struggle and should make us uncomfortable. Once upon a time I thought all I had to do was write and the publisher would do all the promotion. Not even close. I’ll be worried if I ever get comfortable with tooting my own horn. I’m more than willing to sing someone else’s praises though. Great post! Thanks, my friend! I don’t ever want to get comfortable with it, either! Huge smiles on this end, Denise. Thank you!